All the Keys to Emerald City started out life as a junky old pot metal necklace interspersed with red plastic beads. I wanted to use it as the base strand for a charm necklace, wiring the treasures on to beads that had been added specifically to serve as anchors, but I had no clear idea at first what the theme or colors would be. 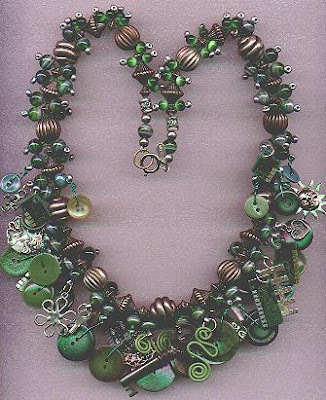 I had many collections of items waiting for the right home, but it took some deep green computer circuit boards with their silver-colored designs to bring the correct items together with the pot metal necklace. Sorting through my collections, I was able to pull together a wonderful assortment of non-matching green vintage buttons in graduated sizes, green glass beads in several sizes that looked good with the buttons, a large collection of silver and pewter charms and do-dads, and (of course) some circuit board pieces. I especially liked the softer antiqued silver and the pewter pieces since the pot metal beads have a soft, warm pewter-like glow. I knew this was going to work when I found some pewter colored glass 6o pony beads with holes large enough to accommodate the wire for the charms. I chose an old skeleton key first, as my focal "charm." Ranging upwards on both sides of the key went some smaller mechanic's keys and other symbols that I love: stars, sun, heart, circuit boards and a hammer (signifying my love/hate relationship with computers), floral motifs, a cross, and wire spirals. Here are the basic steps that I took to create All the Keys to Emerald City necklace shown above. With a few modifications, the instructions can easily be adapted to any themed set of treasures you wish to use. Crimp Beadalon or SoftFlex wire around small loops that you've turned in the ends of two 3" pieces of 20 gauge sterling silver wire. String your large base strand beads in a repeating or symmetrical pattern with a #8 seed bead between each. Crimp the free end of the Beadalon around the other piece of silver wire in the same way. Tie and glue nymo thread to one of the end loops. Add anchor beads between each bead of the base strand in the following manner. Pass the needle through a base strand bead, add the anchor beads, and, skipping the last bead added, pass the needle back through the other beads back down to the base strand. Pass the needle through the next base strand bead and repeat the pattern all the way across the necklace. I used the following pattern to create each anchor: for the first few inches at each end, I used a #8 seed bead, a 4mm round bead, and a #6 pony bead. The opening of the pony bead is wide enough to accomodate the later passage of wire when you are attaching your treasures. For the middle segment of the necklace, I used 6mm round beads instead of 4mm. Repeat the thread path with another strand of nymo, wrapping about three times around the base of each anchor to stiffen and reinforce them. Spread out your buttons and charms, working from the center outward, and wire them into place. Slip a colored 22 gauge wire through the hole of the #6 pony beads to attach them. I confined my add-ons to the middle of the necklace. Place bead caps, cones, or wide holed beads over the sterling wire loops to hide them. Add more beads to the remaining silver wire as desired and form a wrapped loop aroung the clasp to hold the weight of the necklace securely. Copyright 2005 Cyndi Lavin. Not to be reprinted, resold, or redistributed for profit. May be printed out for personal use or distributed electronically provided that entire file, including this notice, remains intact.